In a move that is more reminiscent of a sophisticated investment broker rather than a non-profit, tax-exempt 501(c)(3) corporation interested in promoting "medical professionalism," this year's tax records of the ABIM Foundation (which is affiliated with and shares the same address as the American Board of Internal Medicine (ABIM) in Philadelphia, PA) show the Foundation has total assets of $81,831,953 and moved some of its assets offshore to the Cayman Islands and Dublin, Ireland in the form of non-publicly traded investments. Recall that the ABIM Foundation was created by secretly funneling $55 million in physician testing fees from the ABIM to their undisclosed "American Board of Internal Medicine Foundation" (later renamed the "ABIM Foundation" in 2009) from 1989 through 2008. Only after the name change with the IRS in 2009 was the ABIM Foundation revealed publicly. According to this most Form 990, not only does the ABIM Foundation continue to hold their $2,356,267 Philadelphia condominium bought with practicing physician testing fees, we now find they have systematically transferred $6,516,936 of our fees offshore to ten different funds (nine in the Cayman Islands totaling $6,042, 336 and one in Dublin, Ireland totaling $474,600). Meanwhile, younger physicians can't afford the fees for certification and re-certification mandated by the ABIM. We should also note that the President and CEO of the ABIM and ABIM Foundation, Richard Baron, MD, pocketed a cool $812,006 last year without night call or having to subject himself to any of the tough discussions with patients. The Internal Revenue Service (IRS) needs to immediately revoke the non-profit status of the ABIM and its Foundation. Practicing physicians now realize these organizations are more about protecting and growing their assets than benefiting physicians, their patients, or the public. There's a wonderful social media principle that might just stop Maintenance of Certification: the Streisand Effect. The Streisand Effect is the phenomenon whereby an attempt to hide, remove, or censor a piece of information has the unintended consequence of publicizing the information more widely, usually facilitated by the Internet. And when the American Board of Internal Medicine (ABIM) resorts to thuggery and strongman tactics against a physician, this might just come back to bite them in the private parts. Imagine, you are a physician and your regulatory agency strips you of your privileges to practice medicine without due process. Then imagine the same regulatory agency refuses to release information pertitent to your defense for months and months. Then imagine, that same self-appointed regulatory agency decides to subpoena you for additional information for their case against you on the busiest travel weekend of the year with only 17 days notice (usual and customary time is 30 days notice). Then, after your attorney politely tries to plea for an adjustment of dates, that same regulatory agency that seems unable to provide information to you, basically says to your attorney: "Your client may choose to disregard it - and the sanctions such disregard will bring - at his own peril." 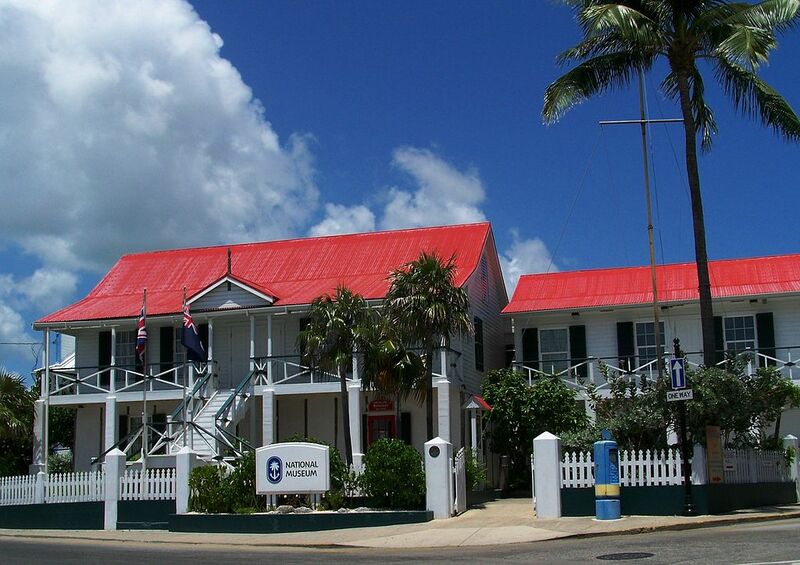 Welcome to the legal tactics of the ABIM that is feeling the heat of Dr. Salas Rushford's discovery requests and their upcoming meeting with the judge in the case on 3 June 2016. In 2015, Dr. Salas Rushford had a gross income $69,725 and a net loss of $1875 in 2015. 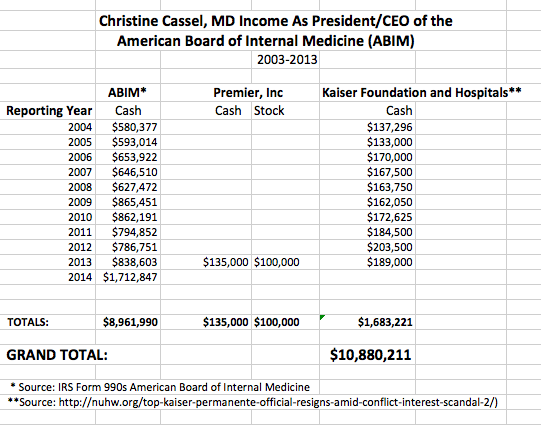 Compare this amount to the $10.88 million Christine Cassel, MD earned from the ABIM and her cronies during her stint as President and CEO at ABIM from 2003-2013. According to their recently-released tax forms for fiscal year 2015, the ABIM recieved revenues of over $57,620,000 in its fiscal year ending Jun 30, 2015 and Richard Baron, MD (the current President and CEO) pocketed a cool $812,000. One thing I know. The Internet doesn't like bullies that are trying to hide something from the public (just ask Barbara Streisand). To me, this young man who has been accused of wrongdoing by the ABIM deserves a fair shake. Imagine what would happen if every US physician, internist, or medical student donated $1, $5 or $10 (or more) to his efforts - it would be a game-changer for the ABIM and for working physicians. Consider donating to Dr. Salas Rushford's defense and countersuit of the ABIM here. P.S. : Consider sharing this post with friends. In its never ending push to preserve the lucrative Maintenance of Certification (MOC) revenue stream, the American Board of Internal Medicine (ABIM) once again announced a "new option" to complete their corrupt MOC program to beginning January, 2018 (corresponding press release here). Allow physicians who engage in and perform well on these shorter assessments to test out of the current assessment taken every 10 years. What "identify verification and security" tactics will be proposed to maintain control of the American Board of Medical Specialties' (ABMS) proprietary MOC program. Let's break these two unmentioned issues down, since they are increasingly at the crux of the corruption at the ABIM and ABMS. While I do not know what the "new pathway" will cost, we should note that the changes promised by 2018 only provides another way doctors can provide funds to the ABIM. Their proposed "change" does not remove the requirement for the clinically unproven re-certification MOC metric or its secure examination. Importantly, the new proposal does not address prior fraudulent tax filings or secretive funding of their ABIM Foundation from physician testing fees. 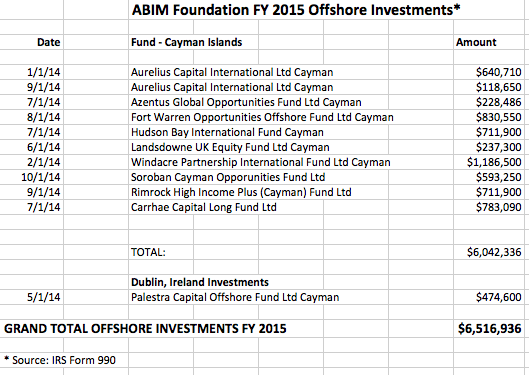 What we can be assured, however, is the ABIM is desperate for cash to fund its operations and protect its tests. Given what we now know about the ABIM financial burn rate, it is safe to estimate that the ABIM needs to extract at least $200 per year from each and every internist in the United States (and maybe $300/year from specialists) to maintain their current cash flow. Look for cost of ABIM's MOC program to be $200-300 per year for physicians irrespective of the various "options" or "pathways" the ABIM constructs to fulfill its MOC re-certification requirement. Test security is everything to the ABIM. Without it, anyone could replicate their process or "steal" their copyright-registered health information. Few details of how the ABIM plans to perform "identity verification and security" are forthcoming with their latest press release. But one thing we know, the ABIM will continue to have physicians entrap themselves in contract language promising secrecy and to observe obscure "pledges of honesty" before performing any MOC testing. The Kryterion Certified Online Proctors (KCOPs) are trained to watch and listen for any unusual behaviors from the test taker. For example, unusual eye movements, removing oneself from the field of vision and making atypical noises are all noted and a behavior alert is sent to the test taker, depending on the business rules you set. The test taker is required to acknowledge the alert before continuing with the test and the KCOP resumes or stops the testing process, depending on the action you’d like us to take. What legal action does the ABIM or Kryterion plan to invoke if they feel my eye movements are questionable? Yet this is the reality of "secure testing" that the ABIM might utilize. And as we've seen, it appears the ABIM is all to happy to deploy their lawyers on physicians at the slightest hint of a "testing irregularity" to extract even more revenue from physicians and to protect their monopoly. Sorry. but I don't want Big Brother in my house. If this is how the ABIM plans to assure I'm compliant with my continuing medical education just so they can extract more revenue from me under the threat of litigation, they've got another thing coming. ABIM has still not addressed its financial transgressions, multiple corporate conflicts of interest, high salary structure, and fraudulent tax filings. Unless and until these issues are addressed, look for the practicing physician community to avoid further interaction with the corrupt ABMS MOC program irrespective of any further changes to their MOC program the ABIM might propose.